A few weeks ago I wrote a review of FMJ ammo that AmmoMan sent me to test. It was a very interesting experience, so I anticipated pretty much the same with the hollow points they sent. That proved to be the case. 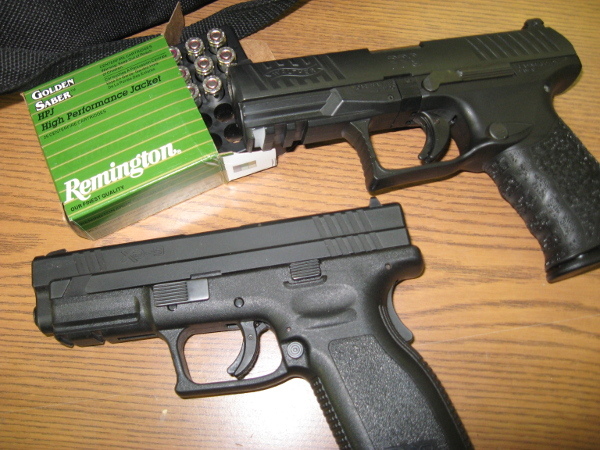 Along with the caliber wars, the people of the gun also discuss things that affect suitability of different kinds of ammunition for self defense purposes. One of those factors is penetration. We know that a solid, round nose bullet will penetrate seriously, and the concern is that it will pass through the target and possibly harm others. It may also not produce the trauma needed to stop the attack. So, many of us use a hollow point round that promises to blossom out and not over penetrate. The question is, do they perform as advertised? You can do a search (as I did) and discover the professional tests done on many different brands and calibers, of course, but I’ve always been curious about how these rounds might function in my everyday situation. I live in Wyoming, and we have four seasons: Winter, still winter, summer, and almost winter… so the heavy coats are hung on the back door about 9 months of the year, just in case. I set out to see how the three brands of hollow points AmmoMan sent* would perform given that heavy layer of clothing. 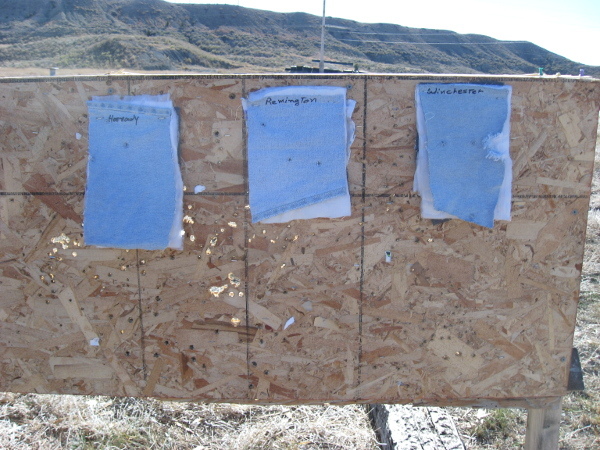 I cut swatches out of some old clothes and put them together for targets, then fired the hollow point ammunition from some common self defense distances, 10 to 20 feet – using the same two guns I used for the FMJ. 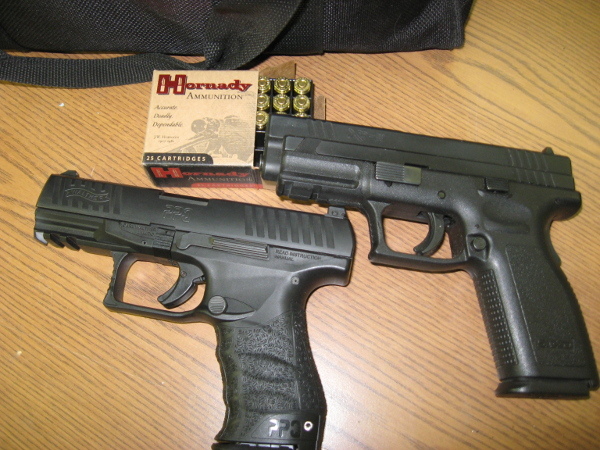 The XD 9mm (top) is my EDC gun, and the Walther PPQ 9mm was borrowed again from my best shooting buddy. I had zero malfunctions with this test, and both guns fed all the JHP ammo perfectly. I stapled the layers of material to dense foam, hoping to capture the expanded bullet, but all I ever found was a few shreds of the copper jacket. I didn’t have access to ballistic gel or anything like it. 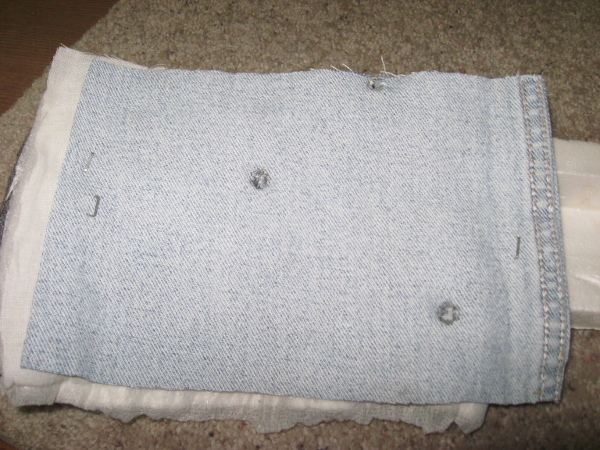 I stapled a pad of the cloth layers to both sides of the foam too, but the bullet passed through the entire thing and vanished without a trace. The conclusion then is that these hollow points are not going to be slowed down by ordinary heavy clothing. I have no idea how much they expanded, since I never could find one. I assume, then, that they would be at least as effective as the FMJ rounds, with maybe a good chance of at least some expansion and increased trauma to the target. This, and the fact that they fed flawlessly in the guns, will have to satisfy me. For this time, anyway. I’ll keep trying to think of a better way to test these great cartridges, and will write again if I come up with anything. *The three brands of ammunition Eric sent: Remmington Golden Saber JHP (147 gr. ), Winchester PDX1 Defender (147 gr. ), and, Hornady Custom, 147gr. XTP). My EDC ammunition is Hornady Critical Duty (135 gr. Flexlock). Results of this test with all four were identical. Once again, I thank Eric at AmmoMan for the opportunity to experiment with the ammunition he sent me. Just for the legal aspect… I did not receive any other compensation for making this test or writing the review… and wouldn’t ask for any. The pleasure was all mine! This entry was posted in Mama's Rants and tagged ammunition testing, Gun ownership, Guns, Self defense. Bookmark the permalink. I just wanted you to know that I came over here to your site for the first time. I may have been here before, but I can’t remember. After engaging with you at The Liberty Zone I just wanted to see some of your own things here. I also want you to know that I respect your opinion and knowledge and hope that I have never come across as disrespectful to you. If so, I am truly sorry, and apologize. I realize that things that I have to say are just opinion and not gospel, and although I hope that they are based upon fact, I am often prone to mistakes, and am always willing to be corrected, especially by those whom I have respect for such as yourself, Nikki, Claire, and several others that you know. I just wanted to stop by and say hi and I will be back when I have more time to engage in discussion and I am sure I will learn from you. Be well, and have a great week. Sending you an email. I’ll attach the book I wrote about self defense. The first chapter is the story of the man I had to shoot to save my life 34 years ago. That incident changed my life profoundly in many ways. Thanks for your comment here.